I didn't wait till 2011 to make this dumpling as I mentioned in my other blog: Vermont Sourdough，I decided to make the dumplings as I saw in the wet market that they sold dumpling leaves. To commemorate a famous Chinese Scholar - Qu Yuan, who committed suicide by jumping into a river on the 5th day of the 5th month on the lunar calendar, chinese all over the world wrap rice dumpling and do the dragon boat race. This festival is called Dragon Boat Festival or 端午节。 Nonya Rice Dumpling originates from South East Asia, very different from the original type found in China, Cantonese, Hokkien community. 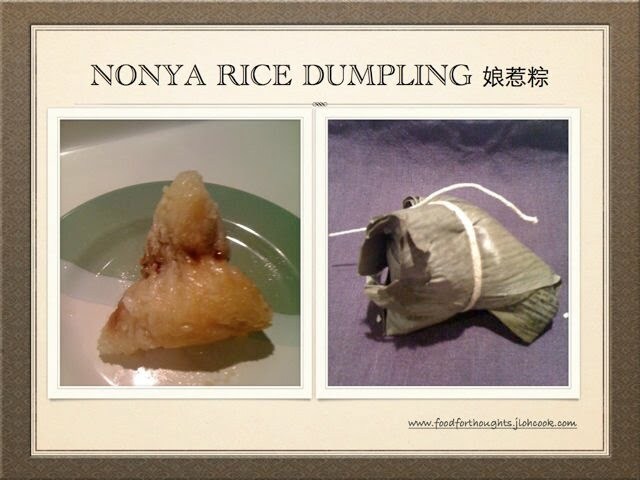 Nonya Rice Dumpling is sweet, with a little spice, the glutinous rice is fragrant and tasty. In addition, Nonya Rice Dumpling used to be wrapped with pandan leaves which gives it the fragrant smell, but this has been changed to the normal dumpling leaves, and pandan leaves are added to the boiling water instead. This food is one of my mom's best of the best. Every year, I look forward to her wrapping this small little rice dumpling and we'll eat it over 4-6 per day, over a period of 2-3 weeks, ending with indigestion at times. Husband and son love them too. When I shifted to Shanghai, that was one thing we crave for every year. As mom is back in Singapore, we would check out who was on the way from Singapore to Shanghai, get them to detour to pick up the dumplings, usually 30 - 50 of them and bring them over. We'll finish it in no time. This year, no dumplings, World Expo in Shanghai, we didn't try to get someone to bring them in. Terrible feeling as I was craving for some. So, with not much choice, I decided to make them, with encouragement from my dear friends, and I saw dumpling leaves sold in the wet market. I was excited. As I was waiting for my son returning from his Beijing trip, I gave my mom a call. She gave me the ingredients, taught me a little on the recipe on how to get the ingredients together. Of course she said it in Teochew, there was one ingredient I had no idea what it was in English or Chinese so that I could buy from the market. It was one of the critical ingredients to get it right. I did a quick online check and finally figured that it was coriander powder. I almost got celery powder which I wondered if it was even available. I went to the wet market, where there was dry food stall, they had everything that I needed, wow, even the coriander powder, imported from India, I was thinking to myself, I'm in luck. I wasn't sure how much I was making, I bought the glutinous rice, and decided, perhaps it was not enough. I went back to grab another pack. The meat fillings: Cut the meat, sweet dried melon into small cubes. Mushrooms to be cut thinly after it is soaked and softened. Chop the dried shrimps. To fry the ingredients, heat pan, garlic first till a little brown, add in the dried shrimps till it smells fragrant, add in mushrooms first and continue to fry till soft. Then add in melon and meat till it's cooked and browned. Add in the fried shallots and mix well. Throw in the Coriander Powder, pepper, and salt and mix the ingredients well. Continue to fry till you get the right smell, fragrant, and taste is sweet and peppery. Leave aside to cool. 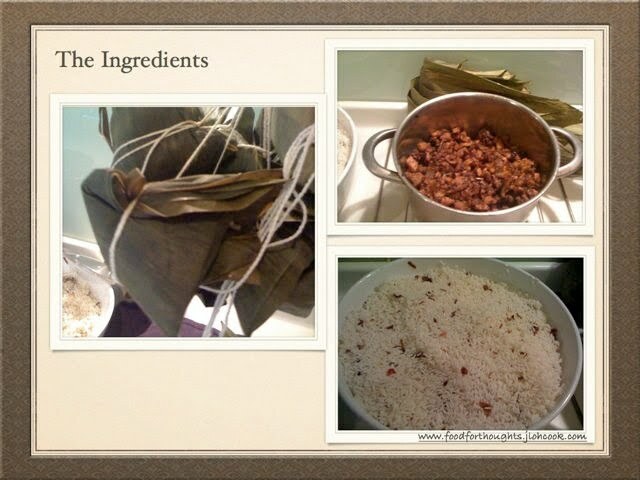 The glutinous rice: Wash the glutinous rice, add in oil, shallots and salt and soak it over night. The dumpling leaves: Soak and wash the leaves well. Soak it up to 3 hours to soften the leaves. The chestnut: Boil the chestnut till soft. The strings: Cut the strings to about 50cm each, and tie 6 together with a knot and holder to hang. The 2 pieces of leaves, and ensure that its the right side up. I'd recommend to cut off the stem of the leaves. Twist it to make a V. Fill 3 tsp of rice, make a hole, add in the meat - 3 tsp, put 1/2 a chestnut, and fill it up with rice, about another 3 tsp. 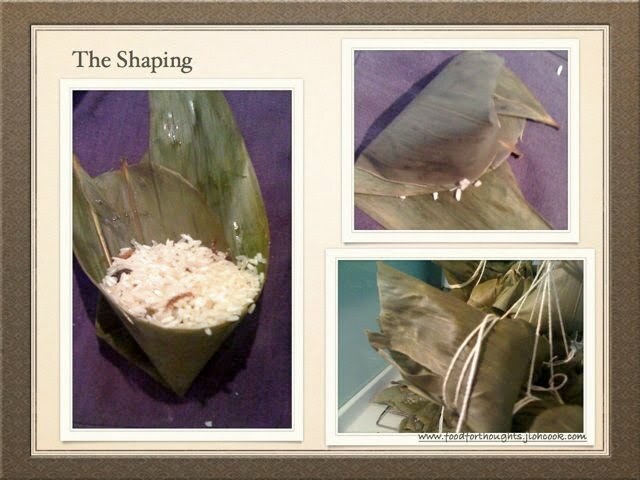 Pack it tight before folding in the top of the leaves over the rice, and holding the sides down, tie the string tight. I made a total of 36 dumplings from this batch. In this process, I must say I had my frustration. My first 10 dumplings look horrible, I didn't know how to handle it. I didn't pack it in, and making the tying difficult as it was too loose, and loses its shape while I tie. I rested for a few hours, trying to recall how my mom did it, and how I had tried helping her wrapping the dumpling. I kept repeating the process in my head and went to try again. I finally got it after I think the 16th dumpling. I realised I had to pack in properly, don't be afraid that it'll be too much. act swiftly and tying the dumpling, and I must tie at the right place, ie, over the portion that I had pressed down to cover the rice. That was critical to ensure I get the triangle shape right, and also it holds the dumpling together. In order to wrap the dumpling, you'll need to find a place where you can hang the string from so that you can tie the dumpling. I hung my string on my cabinet holder, using a hook. This is probably the easiest but it is test of how well I've wrapped the dumpling. Boil water, add in pandan leave, bring down the fire to small, and add in the dumpling to be boiled for 2.5hours (if you like it really meshy type, up to 3hours). My first few batches, I had 3 of them dropping out which I had to throw away. I didn't have any dropping out from my last 2 batches that I finally got the shaping correctly. After 2.5 hours, take it out and hang it up to dry. 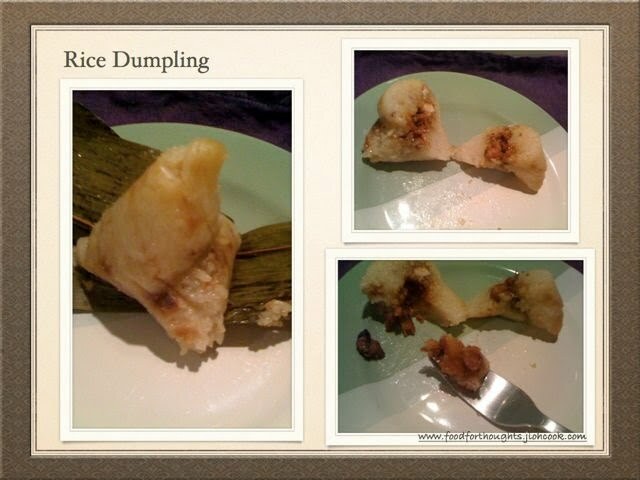 To eat the dumpling, I'd highly recommend steaming the dumpling, heat it up and eat it while warm. This probably takes about 20 minutes or so. Mine is not as great as my mom's, everyone thinks so, I think so too, but I think I got most part of it correct. 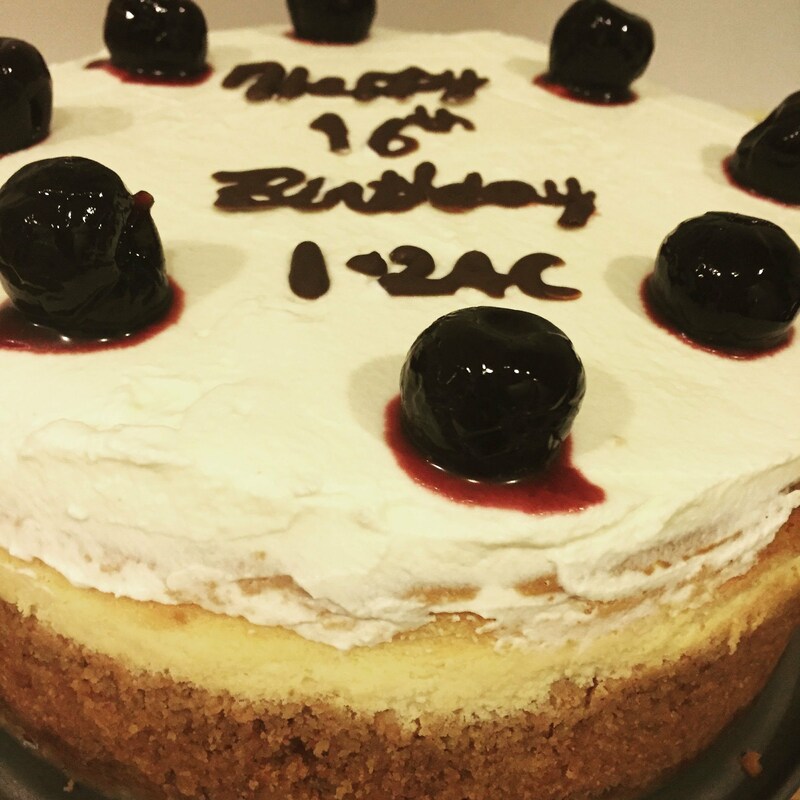 The first few batches didn't have enough ingredients, as I wasn't sure how to pack them in, the last few had more ingredients. As for the taste, the proportion of the meat, dried winter melon and mushrooms was right, but I could have added more pepper to get a little more pepperish taste. The rice was a little too bland, I should have added more shallots and salt to bring out the taste more. Overall, I was quite happy with the result, and now to satisfy my craving, I already had my 3rd dumpling for the day.